I’m a huge drama queen when it comes to my birthday. Everyone knows it and I freely admit it – since I acknowledge it, it makes my irrational behavior acceptable. See, I’m a Christmas baby. Yes, born on the actual day – 8:52 am – Mom thought it was food poisoning from something she ate the night before. On that morning, I burst out at 7 lbs. ½ oz., 21”, with a full head of hair and big issues. From 8:53 on I had to share my birthday with the world. The problem was only compounded by being an only child. You see, we’re naturally selfish if you listen to any pop-psychologist. So, it’s really not my fault, I mean what is? (another thing I learned from pop-psychology). For the last 9 years I’ve had an annual skate party and every year I swear up and down it’s the very last one. As I explained to Jay, “no one ever comes” and then he counted out 8 people who showed up at the last one – really uncool, because in Beth’s new math 8 some how got remembered as maybe 3 or 4. Well, this year was it for me. No more birthday parties. I was throwing in the towel. My grand plan was to count the cards I didn’t receive and throw a pity party for one. Today I got the e-Vite (an e-Vite that I didn’t make for once) which completely made my day. In the hottest pink background possible (love it) I read about “Beth’s Birthday Bowl-a-Thon” and “Bowling for Trolls” with promises that if you bowled a strike or spare you got to “get a prize from the bag of mystery”. How can you resist a “bag of mystery”? April, you crack me up and you completely made my day. Thank you, my wonderful friend. And another thank you for babysitting me through the years and for listening to all of my ridiculous birthday whining (yeah, yeah, thanks to the rest of you who listen to it, too). This entry was posted in Uncategorized and tagged Birthday, Friends, Me. I hate bowling. Truly hate it. But we’ll try to come. Even though you’re a whiner.< HREF="http://www.bigbluemess.com/blogs/anna/2006/12/wah-wah.html" REL="nofollow">Click here.<> DO IT!! 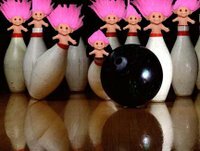 I would totally go bowling if the pins had troll dolls on them like the picture!